With support from celebrity chef Sanjeev Kapoor, Sanskriti broke the Guinness World Record for the largest imarti in the world on 2nd May in the Indian sweets category. Sanskriti, the Saatvik food restaurant in Mumbai, has broken the Guinness World Record for the largest imarti (a sweetmeat) in the world. The sweet has also surpassed the Limca Book of Records. "It's a proud moment for us and I'm very happy that the purpose with which we attempted this event is achieved," shared, Sapna Chaturvedi, Founder-Director, Sanskriti. 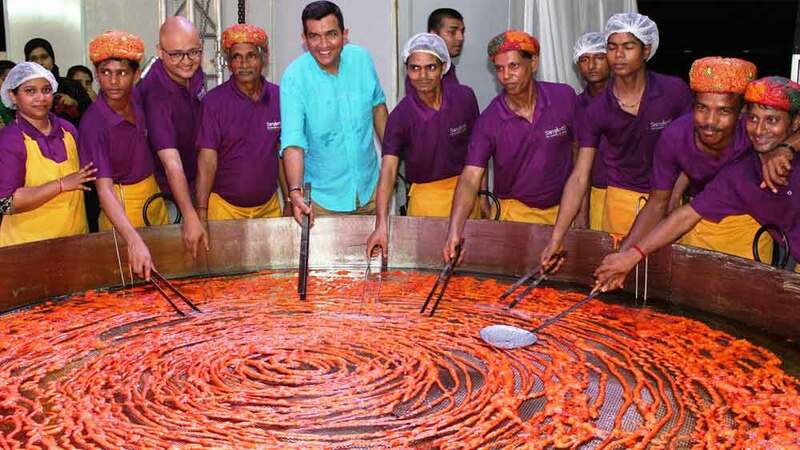 The restaurant broke the record with a 37 kg imarti with an average nine feet diameter. Headed by Gaurav Chaturvedi, a team of 12 people took three hours and 48 minutes to make the world largest sweet, setting a global record. Apart from this, the team made the largest jalebi in the world. They broke the record for the Limca Book of Records on May 3. The sweetmeat weighed 18 kg with a diameter of nine feet, breaking the previous record of 8.2 feet. It took three hours and 53 minutes to make.